There are some things you don’t really notice about a product until you put it side by side with a competing product. I’m packing for my yearly camping trip and am trying to decide which rolling toolbox to bring with me. 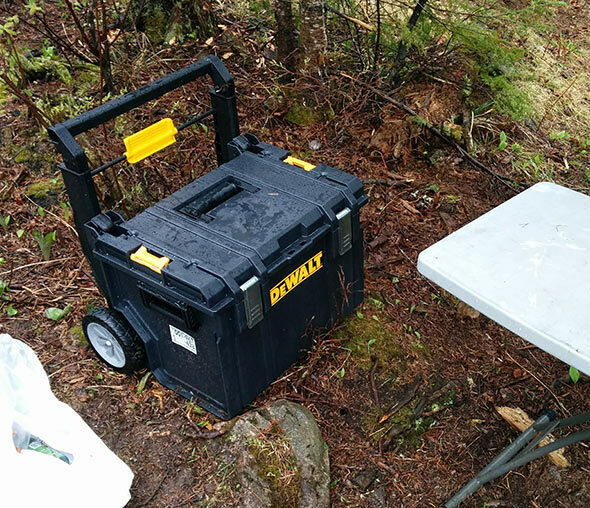 Last year, I brought the Dewalt Tough Box rolling toolbox camping, and it worked out pretty well. I was thinking about trying out the Packout this year, but some things about it bothered me. So I brought the two rolling toolboxes together and several synapses started firing in my brain. The first thing I noticed when I got the boxes side by side was that the interior of the Tough System box is pretty much a rectangle with a few ribs, whereas the interior of the Packout is very irregular with bulges everywhere. 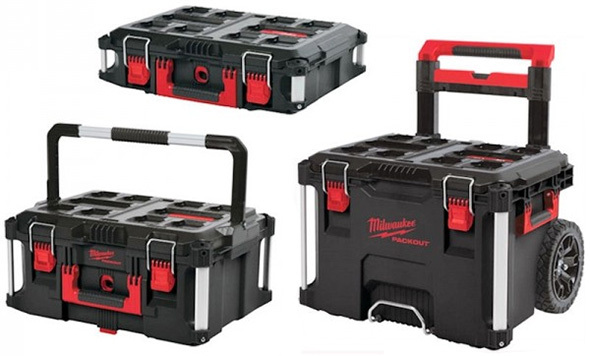 Even though the Milwaukee Packout rolling toolbox has larger wheels than the Tough System rolling toolbox, they have very similar external dimensions. They also have similar internal dimensions — to a point. Trying to compare the volumes is tough; I can’t find any specs for the Packout internal volume and trying to calculate it would be a nightmare. The Tough System rolling toolbox volume is said to be 3927 cc. For the argument’s sake, let’s just assume that they are similar in volume. Having a similar volume doesn’t mean that both boxes are equally usable. 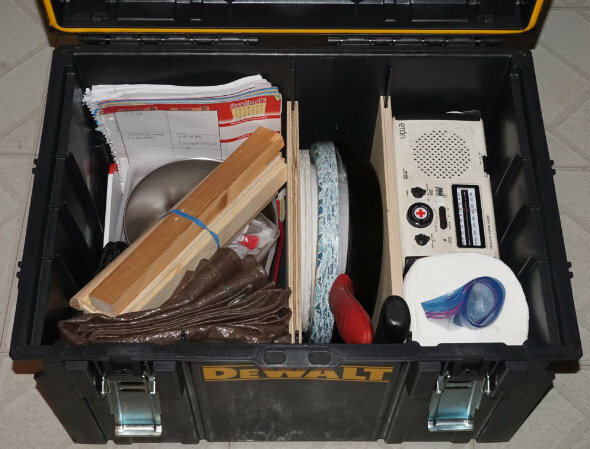 When you are trying to fill the boxes with tools and supplies, it is going to be easier to fill and arrange the tools with less wasted space in a rectangular box like the Tough System. At first glance, neither box appears to support the use of dividers to partition the space, but with the clever use of the internal ribs, you can fashion some simple dividers out of plywood for either box. 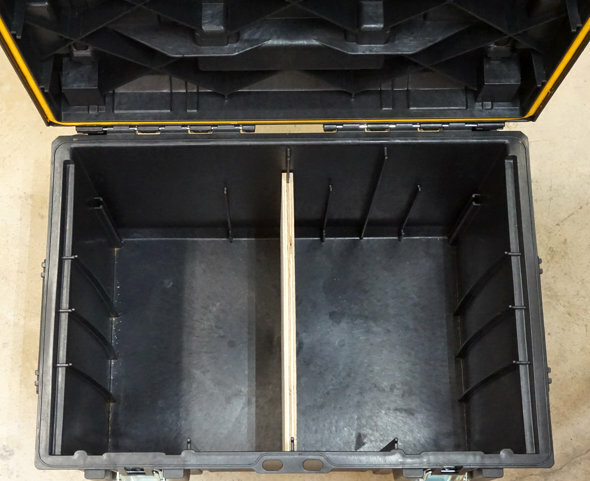 The Packout only has two positions where you can put dividers, and they are not interchangeable, you’d have to make a separate divider for each location. To make the dividers, I just cut some 1/2″ plywood cut to the correct size and then cut some grooves in the sides that ride over the internal ribs of the boxes. Due to the irregular dimensions on the inside, I also had to make cuts in the bottom of the divider to deal with the humps in the middle and the sloping edges. And, I had to make some angled cuts on the sides to account for the slope of the box. On the other hand, I found I had more options with the Tough System box. As an added bonus, the sides are pretty square and the bottom is flat. There are two positions for a short divider from front to back, and three positions for a long divider spanning side to side. I choose not to make a long divider. There are many other criteria that you can use to compare both of these rolling toolboxes and the Packout and Tough System product lines as a whole. For instance, the Tough System rolling toolbox weighs 19.09 lbs, while the Packout rolling toolbox weighs 23.4 lbs. You could compare durability, the connecting mechanism, or even the price of the components in each system. 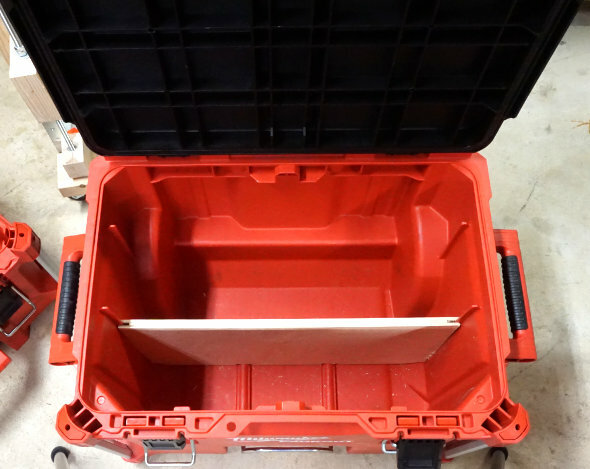 Price shouldn’t be the only reason you choose a product, but it can be a big factor when you are looking for mobile tool storage on a budget. 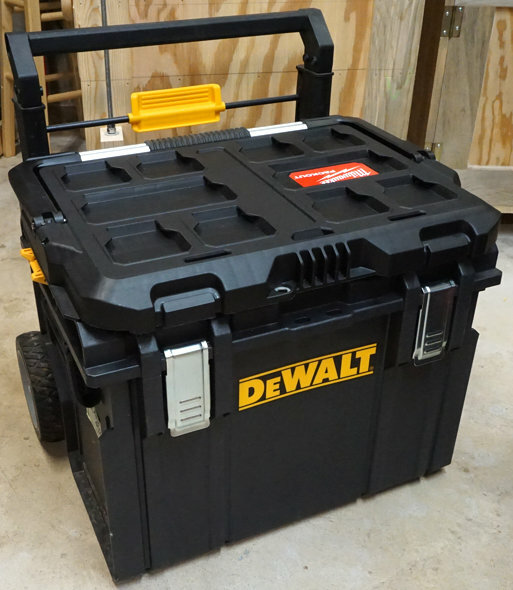 First off, the Dewalt Tough System rolling toolbox is cheaper than the Milwaukee Packout. You can pick it up right now for $70, or watch for it to go on special or clearance at a Home Depot for $40 or even less. In fact, you can get a three piece starter kit with a large toolbox and mobile tool box for about the same price as just the Packout Mobile cart alone, about $130, whereas the Packout 3 piece starter kit will cost you $250. Note: Many Milwaukee Packout components are still hard to find (they sell out fast), so that might be another reason to choose the Dewalt Tough System. As I was playing with the two rolling toolboxes, I remembered the new Packout mounting plate that Milwaukee is introducing sometime after September 2018. 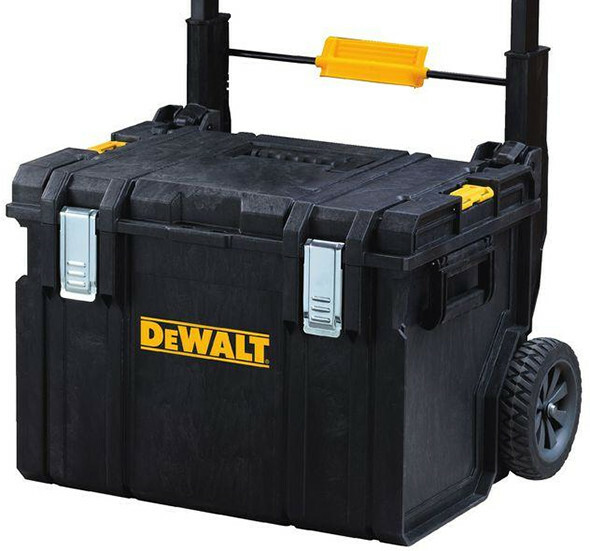 This made me wonder if it would be possible to adapt the Dewalt Tough System rolling toolbox to the Packout — they are relatively the same size. And for the cost of a bracket and some modifications you wouldn’t have to choose between systems. I didn’t want to do any permanent damage to either system right now, but I was curious if it might work. So I took the lid off another Packout box and placed it on the Tough System rolling toolbox. It’s not too large and the the mounting plate looks to be even smaller, so it might be possible to make an adapter bracket with the new Packout mounting plate. Of course, this might work with other toolbox systems too. Once I get my hands on the mounting plate I’ll see if it’s possible, or maybe somebody else will come up with a better idea. Thank you to Milwaukee for the test sample. The Dewalt unit was purchased at retail. Uh-oh… dewalt vs milwaukee! The punches will fly! Just like a cat fight in the cafeteria in high school! It seems like all of the SKUs for the Dewalt combos are all marked as “Out of stock online” and “Not sold in stores” so there aren’t any discounts available on the combo. I priced out the combo of the DS450, DS 130 & DS 300 and they come up at $163.94 separately, but $126.65 as the combo. I’ve been on the fence about the ToughSystem, but your dividers made me want to pull the trigger. However, not having the combo available hurts. The combo tends to be a seasonal item, available in late May/June and late November/early December. But the separates are more widely available year-round. Amazon routinely has a well discounted tough system combo around. I think the current config is; organizer, tote, and large box. I think it’s around $110. If one is looking to initially invest, you might look for something including the wheeled unit, or dolly, but I’ve picked up a couple of these combos through the years for a good deal of duplicate boxes. Any opinion on the robustness of the wheels and axle of each brand under a heavy load? The Milwaukee is rated for more weight. Do you think the DeWalt will hold up after several camping trips? Thanks, Ben. Regardless, Milwaukee is a much better built and much heavier duty product. I own multiple Packout systems and there Great!!! I recommend only Milwaukee! Either way it’s all about Kaizen foam inserts. Tools stay in place, inventoried, and protected. No sir. It’s about wheel clearance. Rolling box is useless with low clearance. Roll it around a job site or go camping, you’ll see. I own sets of both and use them for very different things. The Dewalts have more room and I use them for paint supplies mostly. The Milwaukee are more durable and I use them to put all of my expensive tools inside. I need another set for drywall tools and I’m undecided on Ridgid vs Dewalt for that purpose. I like the room in the Dewalt, but don’t like the connectors that tie the boxes together due to past breakage issues. I like the Ridgid for their connectors, but there are less options available for the sets. Ben, great post. And excellent points all round. I like the idea of all these organisers but as you say, price and usability are huge. The main draw for me will always be organisation and adaptability. They may be expensive but this is why Systainer and LBoxx have the following they do. You can get or assemble bins of varying sizes right in the LBoxxes and they work in the L1, TBoxxes, 52, and 72 model boxes as well. Until Milwaukee and the others get it going with more small parts organisers I will wait. I know Milwaukee is supposedly coming out with a half height organiser but but as of this moment, I cannot even find the regular height model in stores. I won’t pay a premium for lack of availability. Til then if I were going with our American solutions I think it would be DeWalt. Thanks again for the great comparo. Anyone have thoughts about moisture resistance between the two? Thanks. It’s for tools on my boat. I’m using a Rigid now, but I got some moisture in over the winter. The gasket seems good, so who knows why. Even after having both boxes and using them for at least a year, if I don’t go into a box for several weeks, there’s a little plasticky smell when I open them — probably some off gassing — which tells me the seals on both are pretty good. Likely due to condensation – change in temperature from inside to outside the box. If the box is completely sealed it can’t let the moisture out. Put some desiccant bags in the box to control moisture, no matter what product you’re using. The packout keeps water out when the lid is closed, but all the voids in the lid where the next box clips in all hold water so when you open it an unacceptable amount runs down the lid and in to the box. You didn’t mention the latches. Milwaukee’s latches have a more quality and precise feel, as does the rest of the box. I think both latches are adequate for the job. I agree, the Milwaukee latches seem like they have a stronger pull and are more robust, (except when they are loose like they have been on some boxes). If the Tough System met my needs, I wouldn’t worry that the Packout has better latches. Although it wouldn’t be the best test of actual usable volume, you could get the actual volume pretty easily by checking the dry weight and then filling/weighing each of them. I thought about measuring how much water I could fit in each, but the weighing would have worked better. You still have the problem that it only measures the volume of the bottom, you can fill the Dewalt box over the lip and still close the cover. In the end I decided that it wasn’t important for the post. completely agree, any volume difference wouldn’t impact the choice much. Also, using these for camping organization looks like a pretty nice way to organize things (especially with some dividers). My dad has been using these Stanley boxes for camping for years, but any organization in them quickly breaks down into “whatever you need is buried at the bottom”. Yep, the exact volume won’t be a deciding factor, ever. The stuff you covered is more important. The easiest way to calculate and compare the internal volume would be with a liquid test. They are water tight, so you could measure the cubic volume pretty easily. The difference, of course is that the yellow mounts the wheels on the exterior, whereas red in a wheel well. Reds’ should be narrower, which could make a difference when working in tighter spaces. For most applications, I think I would prefer the yellow wheel mounting method. I waited for so long for Milwaukee to come out with theirs, that I wound up getting the Dewalt when the combos were offered on sale around Christmas time the year before last. I think Milwaukee has the better design. Especially how their parts bins can be split in 2 smaller bins side by side are the exact width of one big one. And Milwaukee has soft sided bags that can lock to the system. But the Milwaukee stuff costs close to twice as much in some cases, and is currently only available in “hey look, there are tools to steal here” red. So for the time being I’m sticking to Dewalt. But that adapter idea has really captured my imagination! Milwaukee had a lot of time to develop packout,you would of thought it would have exceeded what dewalt had to offer., from the start….. There are quite a few options that Milwaukee Packout has that dewalt doesn’t as well, they overlap in some areas for sure, but plenty where they don’t. For long-term (1 to 2 week) camping with the Boy Scouts – we’d bring what were called “Patrol Boxes”. They are also sometimes called camp kitchens or grub boxes . All of ours were similarly made and stocked with cooking utensils, pots, pans, small camp stove and condiments. Our boxes had 2 pipe flanges on the short ends to accommodate 3/4 galvanized pipe legs. We also had bicycle wheel holders made from pipe fittings and unions that screwed into the flanges These would allow us to mount a bicycle wheel outboard of both sides of the box to roll it into a site over a meadow or trail. The wheel itself was mounted on one side (no fork) to a pipe cap – that could be attached to our pipe holder. We made three of these for our patrols when we were headed off to Scout camp, and we also had something similar at Jamboree iirc. Very handy and I think we built them as a project in a troop meeting which was neat. I was on the fence between the Tough System and the Rigid modular systems, leaning toward the Rigid for various reasons. When Milwaukee released their take on it, I checked them all out at a HD and in the end took home the Husky modular rolling system, which was only around $75. I still have an option for a two-step cantilevered small parts box that can clip on top of the system for another $20 or so and I have found that the lack of lid for the bottom box and the somewhat smaller and lighter design are actually positives for me (I don’t need it to hold up to throwing around that much). Sissy, we had to carry our camp kitchens by the rope handles…uphill, both ways, through the woods, usually in the rain and mud (seriously, I believe my troop was cursed because it ALWAYS rained on campouts). The bicycle wheel conveyance we made – worked well. We used BMX sized wheels – had 2 sets each with a pipe-axle-attachment. We could roll in 2 patrol boxes at a time – and the rig broke down for easy storage and transport in the truck or station wagons. We’d camp out 11 months per year – sometime 12 if we did a high adventure camping experience in August to supplement our July summer camp. We’d tell the boys that God made the weather – but that we’d make the best of it. We had one experience in summer camp where a couple of pals were struggling with a foot locker. We noticed that they had duffel bags too and inquired about the heavy trunk. It turned out it was filled to the top with cans of soda. Our patrol leaders and SPL were also alert to scouts who seemed to want to forge ahead of the troop while on the trail to the campsite. Their cure for this was to assign them to carry the Dutch ovens. After trying out both in person, the Milwaukee seems better constructed, especially the handle, which sees a lot of stress when carrying large loads, mostly it’s how flexible and loose the dewalt handle is. But overall strength/durability is a concern for many shoppers and I think Milwaukee wins that category hands down! Me neither, every contractor I know around in a hundred mile radius uses the tough system… I know some personally and some are good friends/family and none have complained about the system in general let alone a handle. Granted I really loaded it up, but when I lifted the rolling dewalt box by its side handles, the handle was great, but the sidewall of the box to which it is attached cracked. Dewalt however was great about it and just shipped me a new one. It is a bit of a design flaw, in that the way the side handles are attached to the box they seem to be meant not to be used as carrying handles, but rather as the locking mechanism to their wall mounting system. But the reality is if you put something that looks suspiciously like a handle I’m going to treat it as one. I also think they just mimicked the design of their smaller boxes where the height of the sidewalls is so small that their thinness doesn’t render them flimsy. The other abuse that they aren’t meant for that we all do is “rolling” a whole stack up stairs, and one side of the handle pulled out. I managed to get it back in and now take stairs with caution and it seems to be working but I occasionally have to back off and then start pulling the cart up slowly when I hear the handle slipping. What about the Ridgid tool boxes? 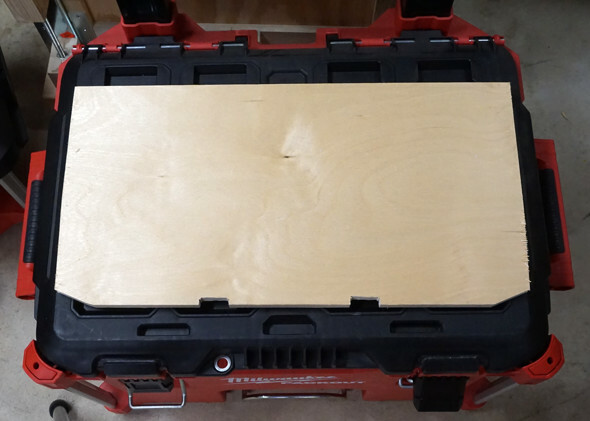 I have one of the smaller Ridgid tool boxes that I can fit under my truck seat and I like it — tough and cheap. I’ve thought about picking up the Ridgid Combo for testing when it’s been $99, but having two separate toolbox systems already takes up enough space. Benjamin,thank you for your insight. I would very much like to know the ground clearance of these units. You see, I bought the cheap T-Stak unit from HD at Christmas. Not only is it flimsy, but the clearance is abysmal. It literally gets hung on lawns and I have to carry it. So very lame. Both have about 2″ of ground clearance depending on how far you tip them. If you really tip the Dewalt you can get 2.5″. You’d think with the bigger wheels the Milwaukee would have better clearance, but the wheels are set further forward which negates the bigger size. If you look at my previous article that I link in the second paragraph, you can see the worst of the trail I rolled the Dewalt box over last year and just got hung up a few times. Time for some third-party skid plates?! I checked the link…most impressive. I wonder if you you have any clever ideas for attaching my T-Stak boxes to the tough system wheeled base. I have been very pleased with my Ridgid boxes. I have successfully adapted a DeWalt DS130 to Mount on top of my rolling PackOut tool box by using the Pack-Aid kit. You must sand the feet off the DeWalt and install the PackAid cleats and latch but it remains water resistant And I can stack all the Tough System boxes, cheaper and more varied on top of my handier, tough Pack Out when going to the range. Cool mod, I didn’t think of going the other way. I’d love to see pics. Milwaukee may have the best system … but way overpriced ( compared to for instance ridgid … and I find their stack kind of dumb boxes, have had it for two years ) … the packout stack on parts bins interest me … or parts bin under the big tool bag ….. but I have yet to see any single packout item at any of the HD, I have been to in NNE ??? I have only seen the 3-piece Packout combos locally a few months ago during the holiday season, and not for very long – they sold out very quickly. 1: The latches. The DeWalt latches are fine insofar as how they hold the box closed, no issues there. My issue is that I’ve had the whole latch assembly fall off on more than one tool box. They’re only wedged in with a small screw and can easily pop off. It’s easy enough to reinstall them, but it’s inconvenient. 2: The way the boxes lock together. The latches on my large DeWalt box don’t latch tightly. Also, if the latch is folded in when you’re stacking, you have to unstack, move the latch, then restack. Again, not a huge issue, but worth noting. 3: The telescoping handle. The way the DeWalt handle locks into position just isn’t sturdy. I’ve had it pop out of place while rolling it full of tools. 4: Overall build sturdiness. 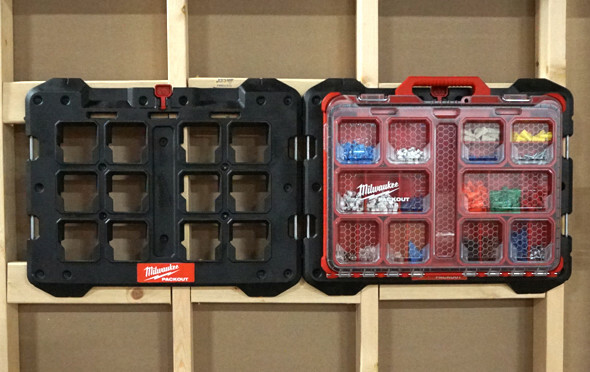 The Milwaukee box is simply built sturdier. I work construction, and I need my tools to hold up to the environment. After using the DeWalt system, I’m just not confident that it’s built for the long haul. 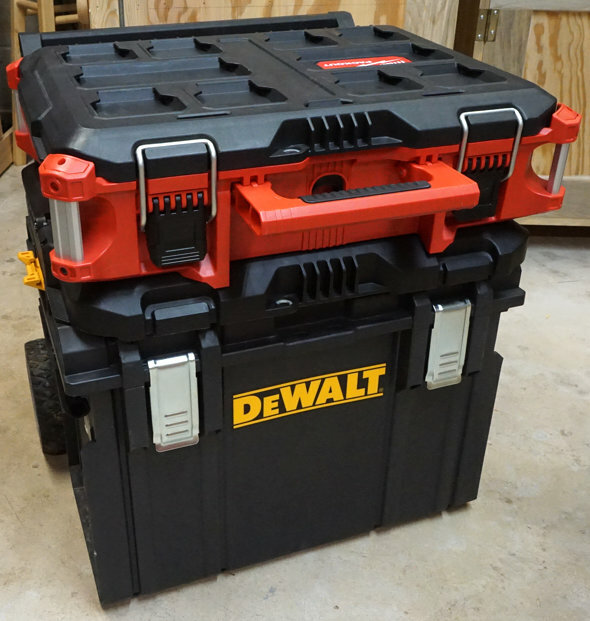 Depending on what you need it for, the DeWalt system might be all you need. For my needs, it just doesn’t cut it. That said, for the money, the Milwaukee packout might be a hard sell compared to the DeWalt, especially if you don’t need heavy duty. For me, I’ll always spend more money for what I consider to be a better product that best suits my needs. Can you open the lid on the milwaukee while it’s still stacked on the cart? I can’t do that with the T-Stak because it hits the handle and it drives me nuts. I had problems with tools rusting in my shed overwinter. Storing them indoors was a pain so I bought about a dozen tough system boxes and moved everything into those with 50g bags of silica gel to help deal with any condensation. Works well. I simply couldn’t afford to do this with Milwaukee prices. I know the toughboxes are airtight in practice as I forgot to unscrew the vent when I shipped a couple of ds150’s with mech & elec tools by air. The pressure difference blew the vent out. Fortunately a press fitted threaded insert so easily fixed. As an aside, one of my favorites for small parts are the stanley 1/3 sized organisers. Fairly cheap on sale, these are gasketed and the long narrow shape lends itself to stacking 3 or 4 deep on shelves. Ditch the removeable parts trays and they are good for long narrow tools like sets of screwdrivers or my crimping pliers. Systainers and lboxxes are neat for organisation but much less robust than toughboxes and crucially for me lack the airtight seals. Have to comment that I bought the toughsystem sack truck / carrier. Good concept and way tougher than the wheeled boxes but it is BIG and fairly heavy. As a hobbyist, not a contractor, I find I rarely use it. I’ve had things corrode and rust in L-Boxxes, even loosely wrapped with plastic. ToughSystem? Nope! Flambeau make boxes with Zerust tabs inside. I wonder how effective they are and how long they work. I recall that one of our suppliers shipped their cabinet hardware wrapped in VCI Kraft paper – much the way folks like Lie-Nielsen and Veritas ship some of their tools. Alick, are those Stanley 1/3 organisers you speak of the ones that have a latch tab molded into the clear lid that snaps over a tab on the main body? I have seen these at Home Depot but have always been leery of them since I have had cases like these before and the lids would pop open at the worst possible moment. Have you had any issues with them? I have been staying with things like the DeWalt or Milwaukee satchel types that have a metal loop hasp that goes over a protrusion on the case and then the other part of the hasp cams down under pressure til it latches positively with a snap. I have about a dozen of them in total, bought on three different occasions when they were on promotion and good value. Second time around, it was a mail order buy and I noticed exactly that problem of the moulded tabs not engaging very far. I wondered if the dies used to mould them were either less good or wearing out. The first and last I bought, they were much better. I don’t carry these around a lot, their value to me is a stack of slim boxes will sit on a narrow shelf and the gasket means my kit stays rust free when it’s damp. 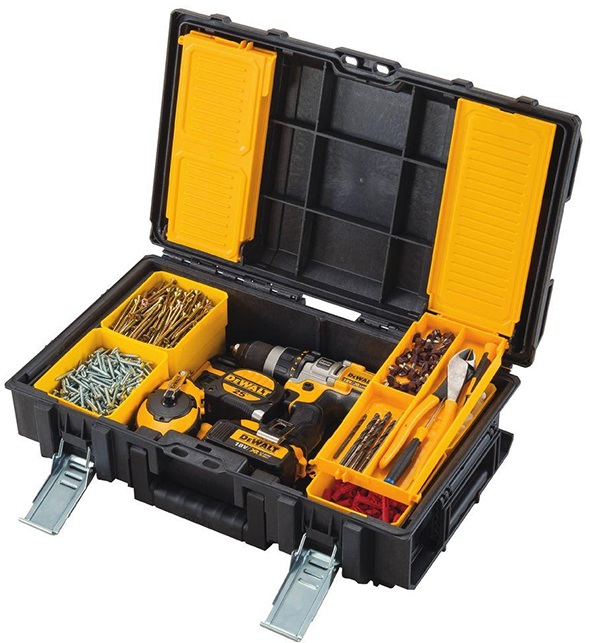 I have few examples of many stanley & dewalt organiser cases and agree that the ones with the proper metal (strongest) and plastic (ok) latches are best but the 1/3 size is surprisingly useful. Thank you Alick. The use you put them to sounds perfect and I can already imagine a few items that are used around the shop that need protection but not necessarily in a mobile environment. Great idea. Since several comments here involve Rigid cases, perhaps you could add them to the comparison. It would be very relevant. There price is great and they are very tough. Plus the Lifetime warranty. It’s pretty biased to only mention Milwaukee and Dewalt don’t you think? Why only compare these two brands when there’s a hell of a lot more brands that offer similar solutions? What if someone doesn’t like these 2 particular brands and they want information on other modular systems that are available but they can’t find it because you completely failed to mention anything about other brands offerings. I mean damn, how biased can you be? Just because they’re not the most popular or sold at HD doesn’t mean that they don’t measure up to what someone may be looking for. It really limits the ability for someone to make a good decision when you fail to provide adequate information amongst the vast amount of brands that make modular tool storage systems. If I were someone who was looking for a modular storage system to fit my budget, whether I was looking for a high end system or something more affordable, I certainly wouldn’t look here to find an adequate comparison. So what sort of comparison are you looking for when there’s not much to compare other than a biased promotion of the 2 most popular brands while not mentioning anything about a viable alternative such as roadie cases(which put these to shame) let alone other brands offerings. To make an adequate comparison, wouldn’t it make sense to provide more than just 2 brands or other alternatives? I agree that additional brands deserve to be present … especially if they can be sponsored by Home Depot or the manufacturer. They are the two most popular ones. You can make an argument to include the Ridgid cases but from what I have seen the drop off in quality beyond that is pretty steep. Plus Ben said he only had space for the two. I recall Stuart having done a comparison of L-Boxxes, Systainers and Tstaks – but that was some time ago – so maybe an update is indeed needed. For the last few years – the Dewalt-Milwaukee rivalry (maybe one might even say war) for our tool-buying dollars has got a bit overblown IMO. For us in the US – Bosch seems a bit odd or perhaps disinterested, Makita is hard to read, Hitachi-Metabo is having an identity crisis, Festool is aloof and other brands (Ridgid, Ryobi, Fein, Hilti, Porter Cable, Bosttich et. al. seem to be settling for niche market status ) while Dewalt and Milwaukee duke it out. Now not all of these folks make their own storage solutions – and there are other OEM’s like Keter who make one with their own brand and for others too. Revisiting what’s available – perhaps compiling a shoppers guide might be interesting. Stuart has had coverage of most other systems. These two are the ones with fresh blood and expansion going on at the moment. You never seem pleased, man. I recall there was already a post (pre-packout) that decided the DeWalt was going to be the camp tote for the man. Why should he drag back out a decision making process he already made, and covered? I think Stuart’s backlog of content and his expanding staff are already evidence enough that he’s actively working to provide content beyond what his personal usage and needs would allow. He’s always transparently open to requests, and feedback, but I’ve seen a lot more negative lately than usual, and under a more contemptuous tone than sincere. Stu and his guys have done a pretty amazing and well respected thing in this project and community we peruse at our leisure-let’s not forget ourselves, and devolve to the entitled, off the cuff dissedence which afflicts so much of the internet already. I’m glad that useful comparisons and data were extrapolated from such a mundane task, and grateful to the man made that happen for our benefit. Unless you’re providing your own content, or paying the fellow that is, seldom will every little post fit your personal desire of specificity. Let me add another ‘well said’ to your response, Fred. This is one of the best tool blogs I have encountered. I am hard pressed to find another as transparent, active, and regularly updated. As for the M vs D thing, indeed, they are the heavy hitters right now. As for Bosch, I wish they(I think they are the main North American distributor) would makema major push with the Sortimo line. While I agree with others they are not as rugged as the American models, different horses for different courses and all that. I was poking around Sortimo’s international site this morning and the catalog of L, T and 52/72 boxxes is beyond staggering. From loads of partner companies with custom tool inserts to seemingly uncountable user selectable divider and organiser options, the brand wouldmbe formiddable here in the States. We used a truck upfitter that now works with Sortimo – among others – to provide rolling stock tool transport and storage solutions. I thought it’s pretty clear that this post is about a tough system vs packout competition. Correct me if I am wrong but there isn’t a single modular system that is a direct competition for the tough system/packout at the moment beside the Ridgid. I do own and love the Ridgid but it’s a very limited offering. Everything else like the Sortimo while belong to the modular storage isn’t a direct competitor for the tough system/packout. *Maybe* Ridgid could be worked into a future update. But for this post, Ben looked at has his ToughSystem box, which carried his gear last year, and a Milwaukee Packout sample, and he wondered which of the two he should take on his trip, and go from there. From what I could tell, it’s as unbiased as could be. Should he have looked at Pelican? Husky? Other brands? Maybe, if this was a “best rolling tool box” comparison. But it’s not. It’s a look at the 2 products he had on hand. Additionally, I can say we’ll consider expanding the comparison in a future post, but I won’t apologize for what this post is and is not. ToolGuyd is, and has always been about catering to readers’ interests, as well as our own. It reflects something that Ben was interested in. He had a question, and this post is the answer. The post was inclusive of 2 products, and not specifically exclusive of others. Ben doesn’t have a Ridgid box. I do (in storage and slated to be donated), but I donated all of my Dewalt boxes. So for either of us to do a side by side Dewalt vs. Milwaukee vs. Ridgid comparison? It’s doable, but will probably take a while. Ridgid is for people to take large piles of tools and make small piles of tools. There’s not a lot of organization going on with that system. Dewalt has the real cart, the L-cart/carrier which doubles as a dolly if need be and is IMO the best system out so far. The boxes might not be quite as sturdy as Milwaukee’s but I have put mine through hell and they have held up fine at almost 1/2 the price. I also love my tough system radio and the power station can connect to the top for the radio/boxes, this is a win for me. The small boxes and bags Milwaukee have are cute but (for me) unnecessary. When it comes to long term durability this rating will matter, the more often you pack these systems at or near their rated weight limit the more stress and likelihood they will eventually fail. The Milwaukee seems like it could handle it better since it has a much higher weight limit a full 1-1/2 times more than the next highest, that’s significantly more. Since they are all very much the same volume wise and the primary purpose is to haul around dead weight the weight capacity would seem to be the number one thing a consumer would compare when all other things are relatively the same (they all have telescoping handles, wheels, waterproof seals, and a way to attach a lock) I’m surprised that the article makes not even a passing mention about the significant variances in the load rating especially since the Dewalt is only rated to about 1/3 that of the Milwaukee. I haven’t bought into any of these carry systems yet, I still have my Stanley Mobile Work Station which was a kinda precursor to these systems, and it’s still going strong but when I do I will look at weight capacity first then the other features probably wheels next after all it is about mobility with these products. For now I’m sitting on the sidelines watching these modern mobile work boxes get better all the time. That was an oversight, I could have mentioned it, but didn’t. Specifically when I was talking about criteria in choosing a system. Thinking about it more, I wonder if it is really a good way to compare the boxes? Maybe if we know how each company derived their weight capacity so you can compare apples to apples. Is it limited by the handle? The axle? Deformation of the box? Would one dense weight in one location be different than the load distributed evenly through the box. Is it just for the inside of the box or does it include all the boxes stacked on top? I’m pretty sure the Packout can handle more weight than the Tough System, but is it really 3 to 1? I’m not so sure about that. Is there an industry standard for weigh capacity? I hear what your saying but we do it all the time with everything else, why not these as well, after all it is a truly relevant factor/characteristic. On your other point about what the limiting factor is in determining the weight rating I say; does it really matter what fails? Whether its the handle, the box or the wheels a failure is a failure and will wind up costing the owner in the long run. The fact that the numbers I quoted come straight from the MFRs tells me each of them has done their own internal testing and each company provides some sort of warranty (including Milwaukee which is a limited lifetime one I believe) so I would believe that each company wants to best represent their product. This weight capacity point became apparent to me when I first got my Stanley mobile work station, I outfitted it and realized that it was really quite heavy, my first thought was “wow good thing it has wheels!” Moving the unit in and out of your truck, letting it rest on uneven ground and those types of torsion flex maneuvers can be brutal on these types of gear, not to mentioned the additional force of the shifting of the weight within the toolbox as you pick it up, set it down and while in the back of your truck on the road. I just find it probably (for me) the most relevant factor after recognizing the other attributes are all about the same (as I mentioned above). Construction of the “box” compartment of these products will vary based on a myriad of factors including the material composition, thickness, design (to include strengthening members etc…) so giving it the “eye” test may not be sufficient to surmise the capability and durability of one product over another that’s why I find it helpful when the MFR offers additional information like this. I’m just happy to see these coming to the market and as a consumer I love choices, and while I haven’t bought into any one of these products yet I am going to and I will enjoy the process of getting to my final choice! BTW you guys do great work I read most of your articles so please don’t think for a second I am being critical of your work I am just trying to add (where I can) to the conversation with what I hope is value added information and opinion. Cheers! Very good thoughts about weight capacity ratings. It also reminds me of Jeff Goldblum in Jurassic Park. Just because you could doesn’t mean you don’t think about whether you should. What I mean by that is even though the cases may be rated for a large amount of weight, do we get to the point where we do not want to carry or push it up a ramp? It is like the large Veto Pro Pacs. Built tough, super capacity, and most use them as tool storage on a cart or similar. They use a smaller version for carrying around. And indeed, these cases are aimed at similar use. Still, you likely will have se ersl of these stacked together and weight could be significant. And after all that, I am not saying anyone was advocating loading these to the max. We also must consider that like the Vetos, using a larger one(more weight per unit for the cases) and keeping the weight to say 75% of rating may tske full advantage of the case’s durability and extend usefull life for a long time past other lighter weight units. It is all about choices. Great post. Really made me think. What would you reasonably need a 250lbs (113Kg) weight limit for a single box for? That’s the weight of a large human. You’d need a pulley or second person to lift it. In real life, it could be hard to fill it with tools that actually come close to that weight limit (before running out of space first). Maybe choc-a-bloc full of wrenches? 250lbs is roughly the same weight as 31 reciprocating saws! It could be over-engineered. Nice to quote, but it could be setting the price too high for something that isn’t actually needed (or it might not have any affect on price). 125lbs could be enough perhaps. 88lbs seems too low. I wholeheartedly agree that no one is going to stuff 250lbs into one of these, but I also agree that one could reach 125lbs without much effort. The question is then which one do you think will last longer the one rated at 88lbs that’s now stuffed over capacity or the one rated at 250lbs that’s sitting at half of the rated capacity. My money is on the one that is not over it’s weight limit and I think that is exactly what Milwaukee engineers were thinking when they design theirs to that high weight rating. Depending on where you are, the Rigid version has dominated the market…very robust. Milwaukee has just piggybacked on a sister brands line. Sam, not sure I understand this statement: “Milwaukee has just piggybacked on a sister brands line”. What is the Sister company Milwaukee Piggybacked off of? Ridgid Is independent from TTI (Milwaukee’ Parent company) and under the umbrella of Emerson (Ridgid’s parent company). Now TTI does produce RIDGID (& AEG) cordless power tools under agreement on behalf of them but Emerson does everything else. The Milwaukee Pack-out system is nothing like anything on the market with regards to the construction style take a closer look. Milwaukee has created a strength out of a perennial weakness in the corners of the containers. No I certain that the Pack-Out system is unique to Milwaukee. Lol, unless presented falsely, the common knowledge is that TTI is the parent umbrella company over Milwaukee, Rigid, and Ryobi subsidiaries; stated in order of marketing class, premium, general and home owner…That’s what I meant by sister company. That said, in the Chicago/ Milwaukee land area, the Rigid version is the industry standard atm…yet to see anyone arrive on any site with anything else. I have seen the Milwaukee version…it is made as well as Rigid’s no gripes there. Lol, unless presented falsely, the common knowledge was that TTI is the parent umbrella company over Milwaukee, Rigid, and Ryobi subsidiaries; stated in order of marketing class, premium, general and home owner… But you are correct, and I am wrong…only the power tools are licensed from TTI after following up on your response. The Ridgid brand name come from North Rdgefield Ohio – the original home of the Ridge Tool Co. – makers of pipe wrenches and plumbing tools since 1923. Emerson Electric bought the company in 1966. In the same timeframe as this acquisition, Emerson was one of the main OEM’s of power tools like table saws and RAS’s sold by Sears under the Craftsman name. At some juncture Sears threw over Emerson and their USA-made tools in favor of other OEMs – then based in Taiwan. Not to abandon the power tool business – Emerson apparently cut a deal with the rising star Home Depot. Not a bad deal IMO – considering Sears declining fortunes. It looks like, at some point, Emerson licensed HD to use the Ridgid brand name on some tools (outside Emerson’s wheelhouse so to speak) from other OEM’s. You, therefore might see the Ridgid name on things sold at HD like shovels and garden tools made by Ames, drill bits made by Blu-Mol and Disston ( R.A.F. Industries) , extension cords from Cerro Wire (Berkshire Hathaway) and – the link to this post : small power tools made by TTI. I believe that Ridgid brand vacuum cleaners are still be made by Emerson (Special Products Div.) and Ridgid plumbing tools are made by Emerson’s Ridge Tool Co. Sometimes looking the first 6 numbers of a UPC (GTIN) number on a product’s packaging will give you a clue about the OEM. Thanks for a solid round up and bringing me up to speed. 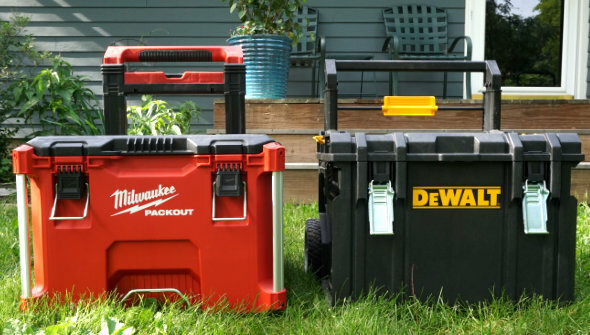 I am interested in the Milwaukee version of portable tool carrier cases, but I don’t see any significant reason to move off the Rigid version which is the only one typically seen on work sites…I think that speaks volumes as to who is the leading version. But Why would the author limit the conversation to a new comer to this market and the general second tier model and not mention any comparable attributes to the favorite of tradesman or other competitors. It just seems weird. Both the Rigid and the Milwaukee rolling packouts seem to be of great quality vs the flimsy DeWalt system as far as I can see. Well that was my thinking, ya just can’t cover the new guy on the block and a B-line player and not give a shout out to the market leader and systems that are comparable to the DeWalt line. The answer is it depends on what you mean by dolly or wall mount. They are not like the Dewalt Tough System. It is a flat dolly and the wall mounts mount on the base of the toolboxes. free shipping from most f the companies, and TAX-free from many, and that saved some cash for sure, which surprised me, which went into more boxes! I now wish I would have loaded up big time on the $44 dollar boxes, they really are great, and so are the others but a huge stack of those into a homemade shelving system would be awesome- and before this Christmas I hated the color Red! – no really I could not stand it, I know fricken weird, but I have converted, Red and Black go together, I also got a few Milwaukee tools- The Tablesaw, which is a cordless Beast! – a Circsaw-and the 2997 combo Gen 3, and I had to get the $159 Dewalt drill/driver Combo from HD that came in another TStak box to go with that system. ( by the way it is made in China, its on the box) anyway – Check out the Packouts and the Tstak system for sure, I will now start some MODS and hope to see more here, or on a YTube channel – get organized man, its the only way to go!